Friday November 4th, 6pm to 12am. Norway House, 1110 Hillside. 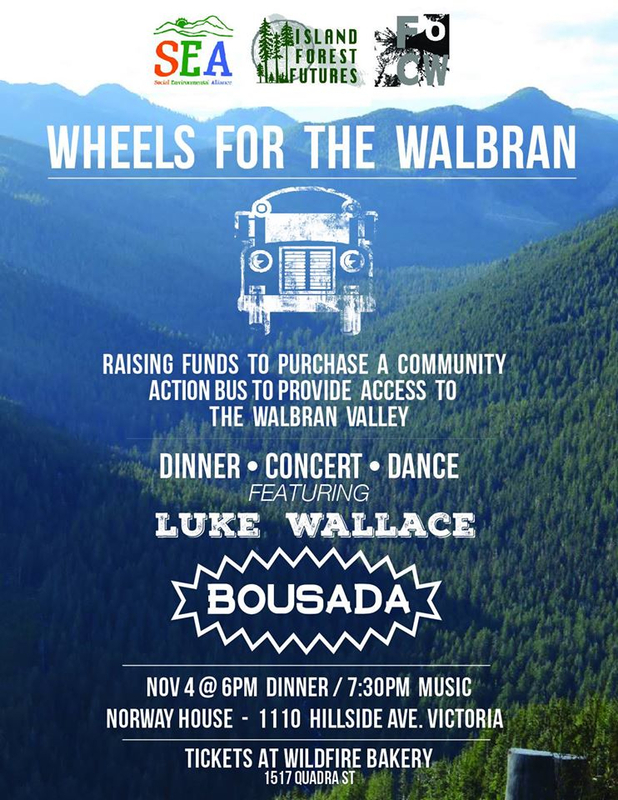 Wheels for the Walbran is an all-ages benefit for the purchase of a mini-bus to provide affordable access to the spectacular and threatened Central Walbran valley, unceded Pacheedaht and Qwa-ba-diwa territory. Chef Jon Cash of Soule Creek Lodge, Port Renfrew and Erika Heyrman of Wildfire Bakery ( of Friends of Carmanah Walbran) will be collaborating to create a gourmet buffet dinner. Musical entertainment for the night is provided by Vancouvers eco-troubador and recording artist Luke Wallace, the young and talented Woody Guthrie of the BC environmental movement. And just announced the ever popular electronic groves of Bousada. Bar and mini- pizzas until closing. Come celebrate this amazing ancient forest, with the community of kindred spirits who love it, as much as you do! Co- sponsored by Friends of Carmanah Walbran, Social and Environmental Alliance and Island Forest Futures.